The Software Studies Initiative collaborated with the Institute for the Future of the Book (if:book) on developing the future of blog-based peer-review. 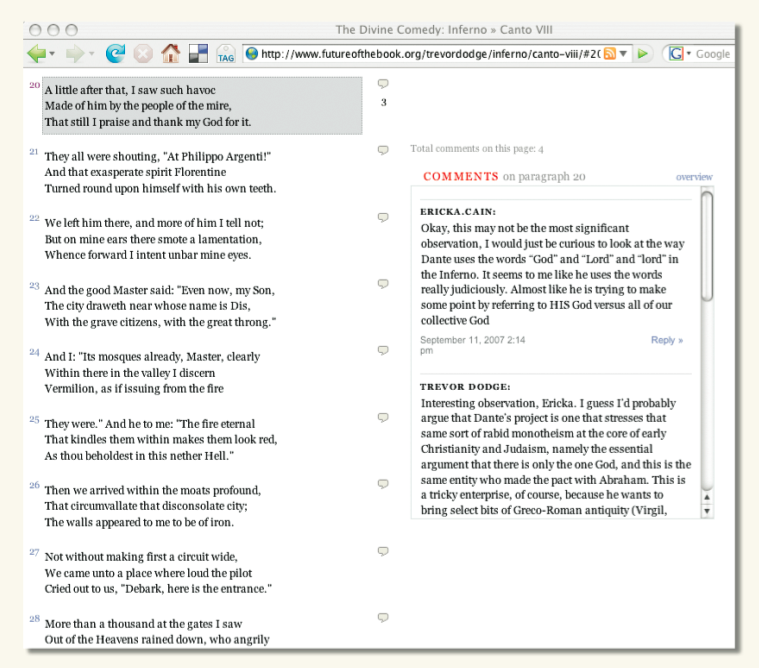 In the latest version, commenting plugin CommentPress (v.1.4.1), which allows comments on invididual paragraphs, can now be integrated with existing blogs. The testbed for the project was provided by SWS member Noah Wardrip-Fruin's, whose online blog-based peer-review of his book manuscript Expressive Processing successfully integrated the stand-alone comment system with an existing and extensive scholarly blog community (GrandTextAuto) for the first time. Software Studies provided programming labor, oversight, and testing throughout the process. review have appeared in The Chronicle of Higher Ed. (PDF) and in The Journal of Electronic Publishing. For more on the history of if:book's CommentPress project, see About CommentPress.